A bike lane on Blair Dr. in Normal, cited during a presentation on Complete Streets to the Town Council Monday evening. "Sometimes different streets have different characteristics and sometimes we have to be concerned about budget. We always are," said Peterson. 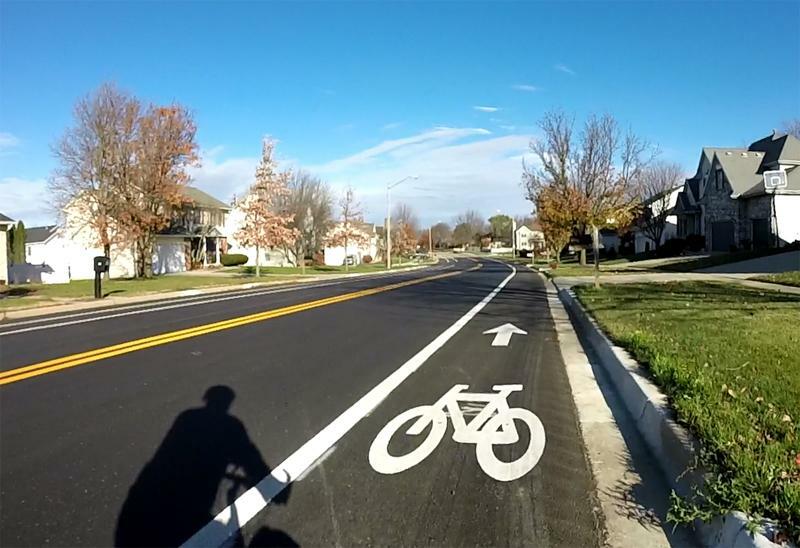 "But, in many cases, the things we are talking about with 'complete streets' are really a matter of good planning and don't result in any additional cost." Peterson said Complete Streets won't fix every problem overnight, but the town will look for opportunities to make improvements whenever possible. The guidelines can include widened sidewalks, curb extensions at intersections, additional bicycle parking, and extensive landscaping. He said the Complete Streets guidelines can help make improvements in street crossings and work alongside Connect Transit. "We're going through a major change in the transit system that will give us an opportunity to take a look at some of those stops and try to improve their accessibility, safety and convenience. We won't fix everything, but over time we will be able to address these concerns," said Peterson. Peterson said the town will make an effort to follow the Complete Streets model with any new projects. Some of the projects following Complete Streets guidelines have already been implemented as part of the Bicycle and Pedestrian Master Plan and Uptown 2.0 plan.